Jimmy DiAnno is a thirty-four-year-old, hard-charging prosecutor in the homicide unit of the Philadelphia District Attorney’s Office. A talented trial attorney, he takes great pride in his ethical responsibility to see that justice is served.Jerry T. Savitch is not just the mayor of Philadelphia-he is “America’s” mayor. He took a shattered city on the brink of fiscal and social ruin and turned it into a thriving metropolis. In Philadelphia, there is no one more beloved-or with more political connections-than Jerry T. Savitch.When Mayor Savitch is charged with a brutal murder, DiAnno is the man tapped to try the case. But for DiAnno, this will not be a simple test of his trial skills. He will learn that there is little difficulty in choosing between right and wrong; but, when faced with two wrongs, the true difficulty lies in choosing which wrong is more right. 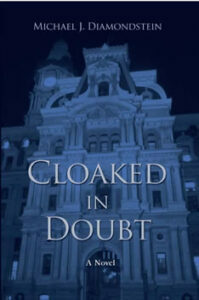 BOOK: “Cloaked in Doubt” (iUniverse Inc.; $16.95; 250 pages). AUTHOR: Michael J. Diamondstein, a Philadelphia attorney. INFO: iuniverse.com. OF NOTE: Successful Philadelphia prosecutor Jimmy DiAnno lets his infatuation with lovely art student Alesa Wex cloud his judgment when she is brutally murdered and he is hand-picked to prosecute the defendant, the city’s beloved mayor, Jerry Savitch. This is not the same old run-of-the-mill mystery. Michael Diamondstein is a new breed of writer. “Cloaked in Doubt” grabbed me from the moment I read the first page. This book takes you on a roller-coaster ride with sub-plots and twists. JADA PRESS is proud to present the prestigious International “JADA BOOK of the Year AWARDS”! 1st Place Fictional Winner: “Cloaked In Doubt” by Michael Diamondstein. NEW JERSEY: In a classroom at the South County Regional Library branch in Winslow Township, about two dozen people gather once a month for input on their writing. They come armed with laptops, handouts and binders packed with notes and drafts. For defense attorney Mike Diamondstein ’96, writing’s a legal thrill. If there is one city with it’s share of crime stories, it’s Philadelphia. From gang warfare on the streets, to corruption in City Hall, Philadelphia is ripe with tragic tales of woe. Bala Cynwd attorney Michael J. Diamondstein publishes his first legal thriller. DID THE MAYOR DO IT? This is the first novel for Diamondstein, a criminal lawyer and former assistant district attorney in Philadelphia.